This Friday night and Saturday I was invited to be the speaker at the Presbyterian Young People’s Society fall convention at Thornhill PC. The theme was God in the Trenches: Where is God when times are tough? I was really excited to be asked and felt really blessed to have been asked. It was also something that stretched me–it’s always a good question to ask; and it’s quite often when we’re in the midst of difficulty when we ask those questions about the nature, presence and activity of God. So it’s a really good topic to explore when things are going well in our lives, mostly because we’ll be better rooted to answer the tough questions when we’re in the middle of it. We’ll be less blown around by the wind and more rooted in Christ. First, we “dethroned” unhelpful (but popular) ideas of God: The Clockmaker, the Big Cop in the Sky, the White Bearded Man, and also the Buddy. Then we tried to “rethrone” a more biblical understanding of God: The awesome God who suffers with us; the God revealed in Community (since he is Trinity); the Transformer God; and the personal Teacher. From there we looked at some of the ways God draws near to us as we draw near to him (based on James 4:8). I had a really good time and am grateful to the executive of pyps for organizing and for Jeff Crawford who is a phenominal youth leader. 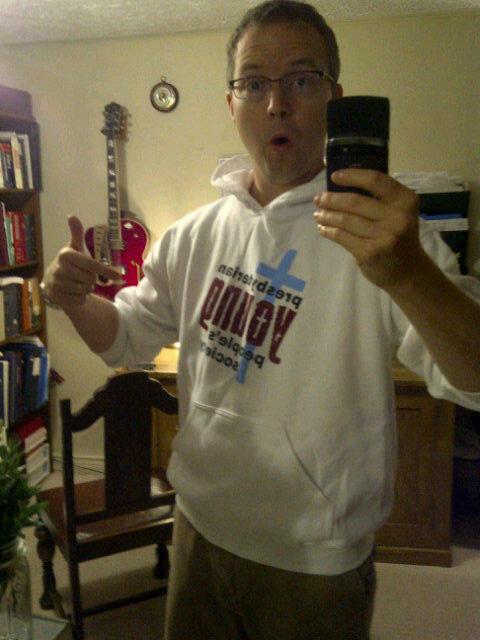 Pictured below is some pyps swag I was given. Thanks! I love hoodies. The best part of the weekend was seeing about 60 young people conntecting, leading worship, organizing, laughing, playing, dancing, learning, and praying together. I am uplifted.